Anyone who follows this blog knows that I've written a lot of about event safety, especially regarding weather and its impacts (I have a blog tag category here). 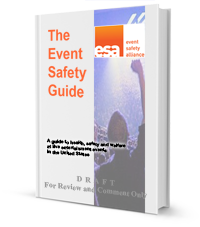 The Event Safety Alliance has now released a draft Event Safety Guide for public review based on a European document. PLASA is behind the effort, so I hope you will take the time to take a look. You have to give them your name and email to download the document, but it only takes a couple minutes. Comments are due August 15, 2013; download your copy here.